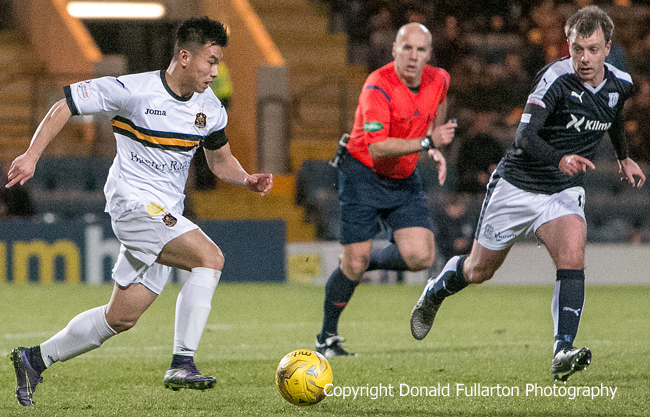 DUMBARTON were well beaten in their William Hill Scottish Cup fifth round replay against premiership top six club Dundee at Dens Park. DUMBARTON were well beaten in their William Hill Scottish Cup fifth round replay against premiership top six club Dundee at Dens Park in front of a 3,500 crowd. Paul Hartley's men dominated from the start and fully deserved their 5-0 win, although some of the goals were on the soft side, but it could have been more. Ex-Son Paul McGinn began the damage against his former club by smashing in an opening goal on 16 minutes, picking up on a Gary Harkins pass. Jordan Kirkpatrick had a good chance for Dumbarton soon afterwards, but could not produce the necessary finish, before Harkins crossed for Kane Hemmings to make it two on 29 minutes. Six minutes after the restart man of the match Greg Stewart left the visitors standing as he floated a third into the left-hand corner of the net. With the final whistle approaching Kevin Holt followed up a shot pushed out by keeper Mark Brown to give his side a 4-0 lead, and the rout was complete when the Dens Park men went nap, as Stewart fired in a 25-yard free kick. There were some good attacks from Dumbarton, with Christian Nade and Kler Heh (pictured) prominent, but home keeper Scott Bain was rarely troubled.